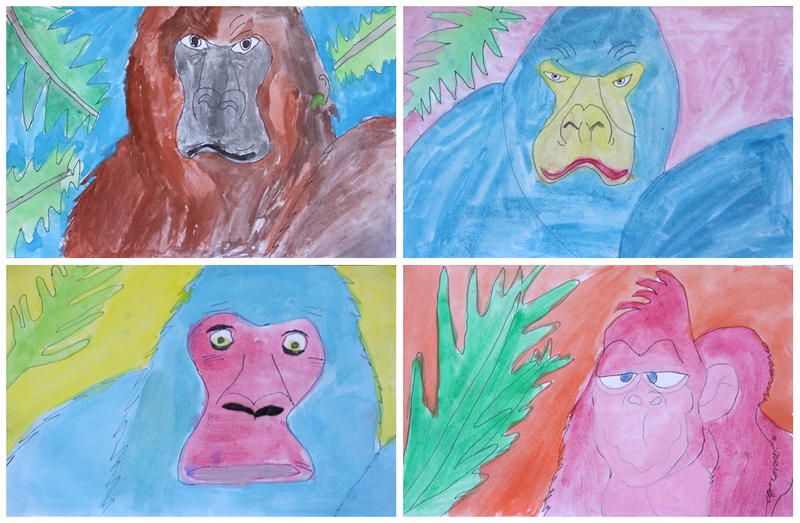 A diverse collection of gorillas now stare down from this particular classroom wall – some menacingly so, others wearily or comically. After pencil sketching, the students finalised their line drawing with permanent marker before finishing with watercolours. These magnificent beasts are the handiwork of a talented year 5 & 6 class. The original, ‘as-per-the-book’ lesson was for the teacher to lead a step-by-step line drawing of an identical gorilla. 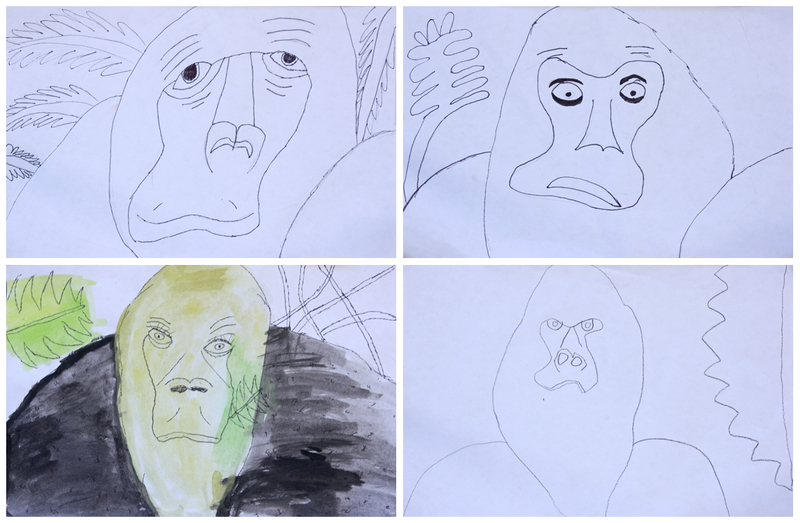 Instead, I searched online and found several different gorilla drawings to project on the smart board. Some of them were quite realistic while others were more stylised and even cartoonish. The students copied or took inspiration from one or more that either appealed to them or seemed manageable! It's important to me that as often as I can, I allow the students ‘room to move’ and make their own art. 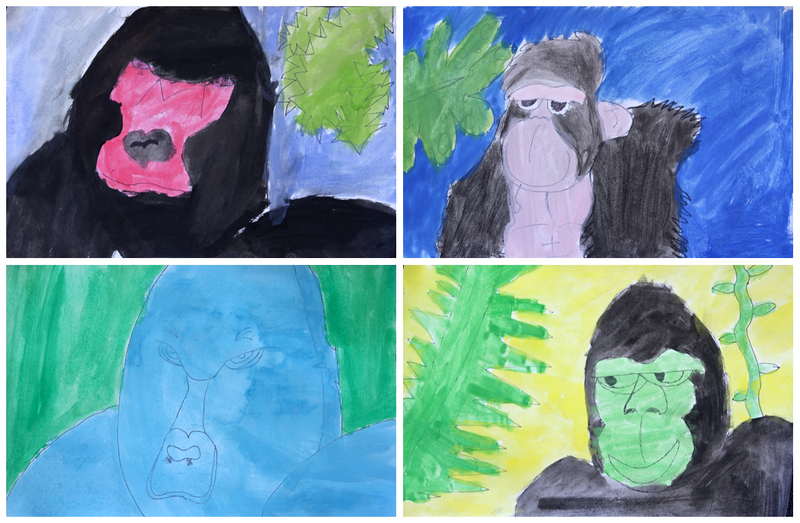 In this case I was asking every student to draw and then watercolour a gorilla up close and personal with a hint of rainforest in the background. I tried to maintain some diversity with the variety of stimuli rather than a single source and made no restrictions on the colours they chose. I'm really glad I didn't limit them to realistic colours because blue gorillas look undeniably cool : ) A homage to the Cookie Monster perhaps? But at the same time, if every gorilla was blue they wouldn't look so special... So my ‘soapbox’ opinion for the week is that we should endeavour to include room for at least some individuality within all our art lessons. 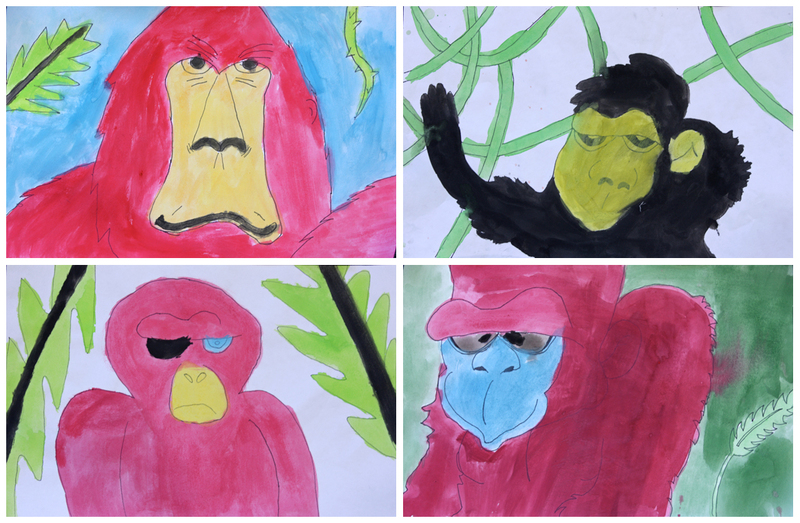 Seeing some of the more unrealistically coloured gorillas reminded me of Fauvism and its emphasis on strong colours over representational or realistic ones. Then I noticed that the French origins of Fauvism appear to mean ‘the wild beasts’. In the future I'm thinking of another lesson where we observe some classic Fauvist artworks before creating our own wild beasts with exaggerated and bold colourways. And as per my quest for variety, if I'm dictating the colour scheme then I imagine the art will feature a diverse cast of animals instead. Joe, I just adore these charming gorillas, and I totally agree with you about encouraging individuality! One more thing... I close the close-up cropped compositions of these gorilla paintings and the design of the negative space. Wonderful! And I'm so glad you pointed me towards your previous Fauves post, that will be perfect to inspire a class when I get a chance to do a similar lesson. The colours are fantastic! I really like Matisse and my wife is like you, a HUGE fan! She still raves about a Matisse exhibition that she saw while I was minding our son in Brisbane a year or two back! 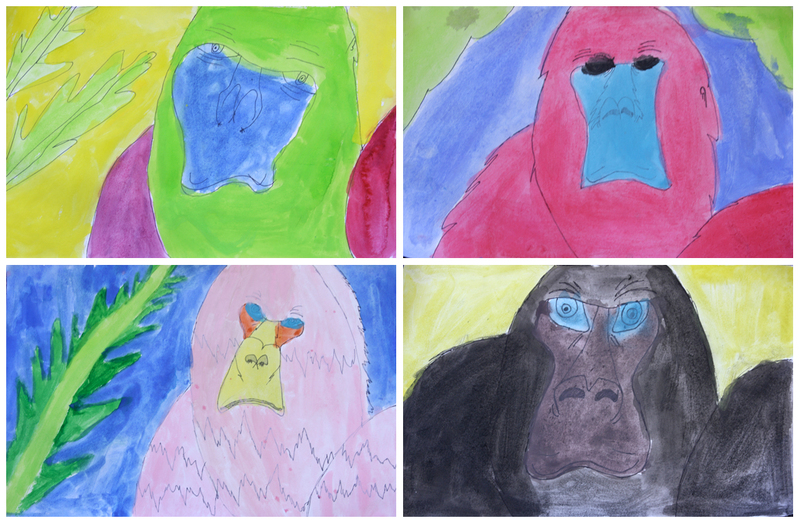 Love these Fauvist gorillas!And I can see a Pop Art influence too. Most of my students get giddy when I give them the "green light" to use an imaginary color palette. Very cool!